Union Minister for Minority Affairs has said that the Central Government is very serious to provide quality education to the boys and girls belonging to Minority Communities. 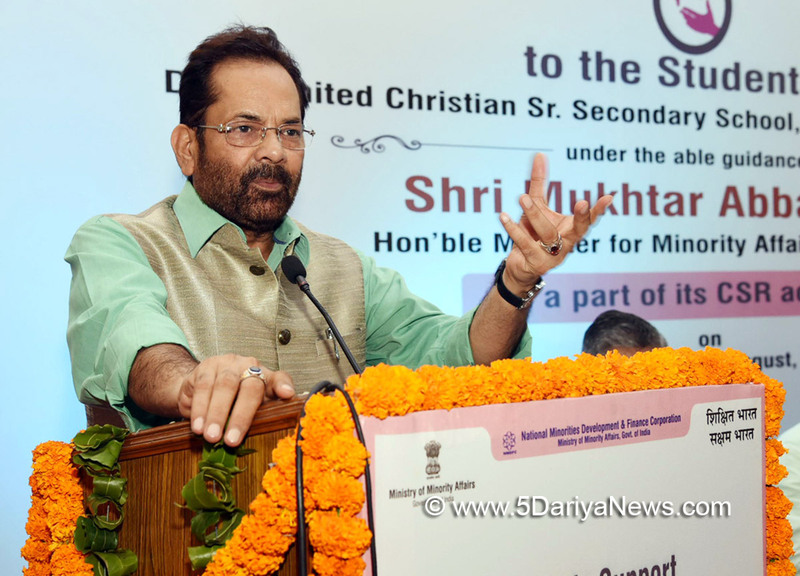 After dedicating a Computer Center for the students of Delhi United Christian Senior Secondary School, Shri Naqvi said that the Government has provided scholarships to more than two crore fifty lakh students belonging to minority communities, during past four years.The National Minorities Development & Finance Corporation (NMDFC) working under the aegis of the Ministry of Minority Affairs, Govt. of India has extended its helping hand for the Delhi United Christian Senior Secondary School by refurbishing their Computer Centre and also providing water coolers with in-built RO system for ensuring safe drinking water, on 4th August, 2018.This support is being extended under the Corporate Social Responsibility (CSR) programme of NMDFC.This could be possible due to farsightedness and dynamic leadership of Sh. Mukhtar Abbas Naqvi, Hon’ble Minister of Minority Affairs, Govt. of India. Mukhtar Abbas Naqvi, while addressing the students, appreciated the initiative of NMDFC in reaching out to schools under CSR programme and extending much needed support to students who deserve such facilities in the schools. He assured the students of the school that the Government is committed to “Sabka Saath Sabka Vikas” philosophy. Therefore they should avail the benefits of a variety of educational support schemes being run by the Ministry of Minority Affairs & other Govt. schemes. Mohammad Shahbaz Ali, CMD, NMDFC on this occasion informed that endeavour of NMDFC under its CSR programme is to extend a helping hand to children of disadvantaged groups to acquire knowledge of Computers, to fulfil the vision of the Government of Digital India. He also appreciated the management of the school in extending education to disadvantaged category students.Shri Santosh Kumar, Principal DUCSSS expressed his gratitude to the Union Minister for Minority Affairs and the NMDFC for helping & visiting the school. He thanked NMDFC for extending this support and assured that it would help the poor children in keeping abreast with the computers & information technology.